As the story is told, our school’s rich heritage began in Dr. Kennedy’s living room in recognition that a vibrant Christian education was critical for both the future of the church and for the growth of the Kingdom. 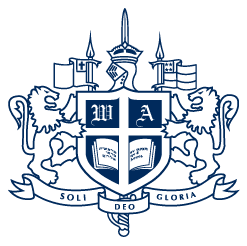 Therefore, in 1971, Westminster Academy launched with the commitment to serve as South Florida’s leading institution linking faith and learning. Four decades and over 4,000 alumni later, we remain focused on the development of critical thinkers, grounded in a biblical worldview, and educated in a culture devoted to Christ and dedicated to excellence. Our 2018 Commencement highlighted the importance of an investment in Christian education. We honored our Distinguished Alumnus, William (Bill) Gattle ’79, president of Harris Corporation’s Space and Intelligence Systems segment. Then, our keynote speaker, Dr. Rob Hoskins ’83, President of One Hope, a prominent missions organization, also inspired us. Both of these accomplished men spoke of the significance of their time at WA and stand as reminders of how God has used WA to impact the world. I ask that you would consider a gift to the Annual Fund. Become a Roaring Fan with a monthly gift of $25 or more, or if you have the capacity to do so, join the Headmaster’s Council with a gift of $2,000 or more. Council members receive complimentary admission to all regular season athletic home games, as well as two tickets to our annual auction and the school play. Those who give or pledge $2,000 or more by September 19 will be invited to the Headmaster’s Council Breakfast on Tuesday, September 25. Donations may be mailed to the school or made online, where you may also set up a recurring gift. Your participation at any level demonstrates a collective investment in the school’s excellence. Thank you for your prayerful consideration.